While Digitrax and Lenz use different Control & Feedback bus architectures, is is quite possible to mix Digitrax and Lenz Boosters/Command Stations, keeping in mind certain restrictions will apply. Because Lenz and Digitrax use an electrically-compatible method of communication between the command station and the booster as defined by the DCC standard, it is possible to mix Digitrax boosters with Lenz Command Stations, or Lenz Boosters with Digitrax Command Stations. Why would you consider such an approach? 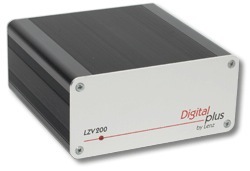 Digitrax boosters can be used with the Lenz Command Station to provide more power for driving the layout. Keep in mind that because of the major differences in the Control and Feedback protocols between Digitrax and Lenz, you will be limited to using devices that are compatible with the particle bus architecture. A short jumper wire used to configure the booster. Connect the track to the booster “Rail A & Rail B” outputs. Note: Each track section powered by it’s own booster should be double gapped at both ends, this pertains to regular layout sections as well as reverse loops. Do NOT connect the other 4 wires of the LocoNet cable. Cut these wires off and insulate them so that they do not touch each other.If you are only using one booster it does not matter which wire you connect to which terminal. If you are using multiple boosters, all White and Blues must be connected to the same LZ100 terminals. Plug the other end of the LocoNet cable into either LOCONET “A” or “B” port. Connect the power supply to the “POWER IN” terminals on the booster. Be sure you have made all the connections described above before applying power to the booster. 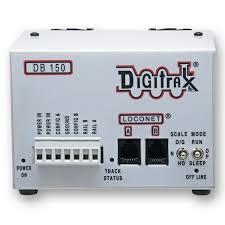 At initial power on, Digitrax boosters configure themselves automatically according to the various switch settings and whether or not the “CONFIG A & GROUND” or “GROUND & SYNC” terminals are jumpered together. If you need to use more than one booster, it is not necessary to run the White and Blue wires from each booster to the LZ100. Once the first booster is connected as described above, you can simply “daisy chain” additional boosters together by using LocoNet cables connected to the Digitrax Booster LocoNet “A” & “B” ports. On a DB150 booster connect the “CONFIG B & GROUND” terminal with a jumper wire. On the DB100 and DB200 boosters place the MODE switch in the P/R position. If your DB150/100/200 doesn’t work properly, make sure that the “CONFIG A & GROUND” or “SYNC & GROUND” are jumpered. If there is a short circuit when traveling from LZ100 command station to the booster section swap the White and Blue wires to correct the short. 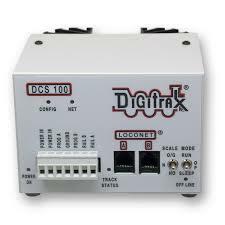 What this does is to encode/decode the DCC control signals (originating from the Digitrax Command Station) onto the DCC power signal (the Lenz Booster encodes/decodes the DCC signals with the track voltage).